We consider our bathroom and en-suite facilities and our plumbed-in washing machines to be everyday life necessities, but what happened in Hornsey’s past when many houses lacked these essentials? 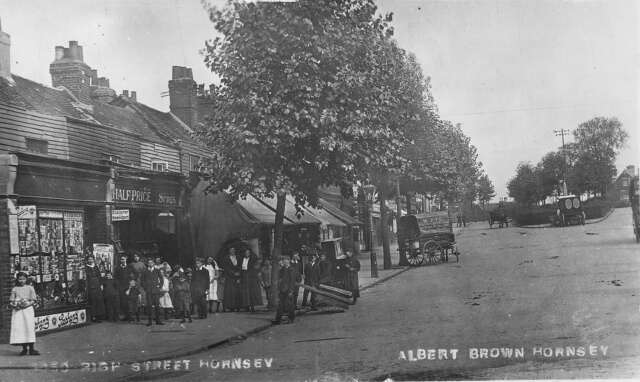 The west side of Hornsey village retained its quaint charm into the 20th century. The buildings were a blend of Georgian houses, early to mid-19th century weatherboard cottages/ shops and solid Edwardian shopping parades. 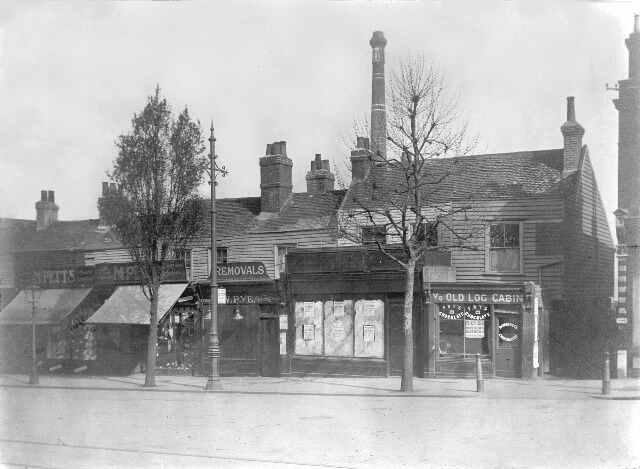 Tucked behind the tree-lined High Street out of sight was Hornsey’s Sanitary Depot. A vital facility, covering 5 acres, it opened in 1886 at a cost of £13,296. The site housed a coroner’s court, a mortuary and caretaker’s cottage. A range of buildings contained a disinfector and fumigator, ambulance sheds, stabling for 20 horses and a horse keeper’s cottage. Dominating all of these was the dust destructor with its tall chimney (see Smithfield Square’s Fascinating Past: 2). The dust destructor chimney towering over Hornsey High Street. Although local authorities had been given powers to open public baths and washhouses in 1846, Hornsey ratepayers were very careful with their pennies and deemed personal hygiene a matter for individuals. The Sanitary Depot housed a steam laundry but no other provision was made for local residents. By 1914 when the First World War started, Hornsey’s building boom was largely over. Streets of middle class housing had been erected in the last quarter of the 19th century with houses linked to main sewers and pipes providing running water. However, the occupants of the small terraced and semi-detached houses in the earlier 1860s housing developments, such as Campsbourne estate and St. Mary’s estate, missed out on these essential facilities. Their homes had been built speedily in the days before main sewers were provided publically and they were often without cold running water. Also, these estates were densely populated. A tin bath in the kitchen filled with hot water boiled on the cast iron range or copper was the best Hornsey’s working class could expect. … in the opinion of this Committee, based on inside and intimate knowledge, the housing conditions of this neighbourhood call for the immediate provision of public baths and wash-houses as an essential adjunct to the teaching of Hygiene in the schools and the work undertaken by the Care Committee. In 1929 W H Adams, the Borough of Hornsey’s Engineer and Surveyor, drew up plans for constructing public bathing facilities with an area for washing clothes. The location chosen was on Hornsey High Street in place of the insanitary old courts. These backed on to the Council’s Sanitary Depot so what better than for the Borough to have all its public health facilities in one place. 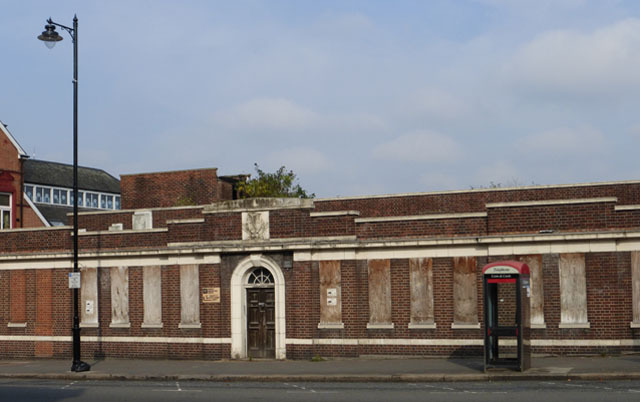 Hornsey Borough Council minutes record that the public baths were built in 1931/32. 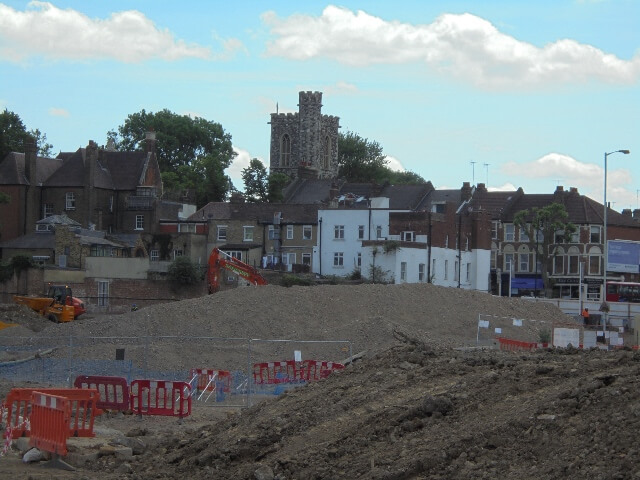 The old courts and quaint shops on the High Street were demolished. A unique, modern, one-storey brick building was erected in their place which opened in 1932. The façade of the public baths changed the appearance of the High Street dramatically. It made the statement that this municipal building was embracing modernity just as Hornsey Town Hall in Crouch End was to do in 1935. Over the main doorway into the baths and washhouse, in stone, was proudly displayed the Borough of Hornsey’s coat of arms and motto, Fortior Quo Paratior (The Better Prepared the Stronger). There were eight baths available for public use with separate entrances for men and women and waiting areas with benches. Toilets were provided for the staff and visitors. The original pitched roof had full length glazed panels to maximize the light and good ventilation for the heated and steamy areas. Lining up for a bath on a Saturday night, sometimes after other family members had used the same water, could be a thing of the past. The washhouse had a large central waiting room with space for prams and twelve large sinks in adjoining rooms. An area with racks and hangers contained blow dryers and heaters. Motorised mangles for squeezing the water out of bed sheets and clothes were provided as well as a large table for folding dried items. The building had a community function as well as a public health one. Neighbours could meet and chat instead of having to carry out back-breaking chores in the isolation of their home without the benefit of the washhouse facilities. We know from the Hornsey Borough Council 50th Jubilee publication in 1953 that there were still 33,000 users of the baths. 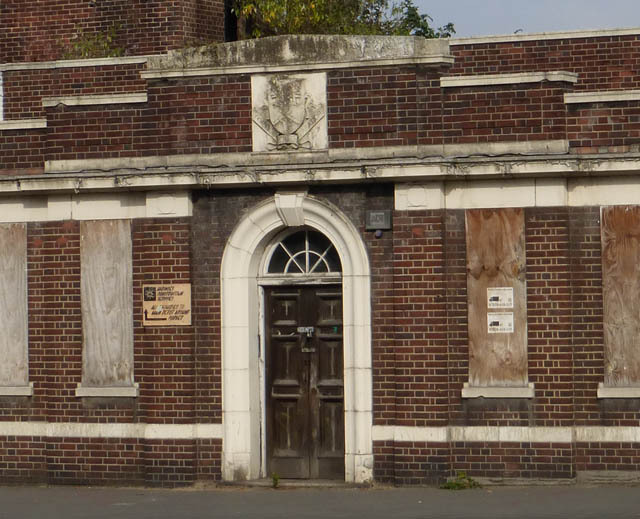 The public baths and washhouse closed in 1970 no longer needed by the community. For a time the building was used as council offices but once vacated it fell into disrepair. The Sanitary Depot on the other part of the Council site had gone. 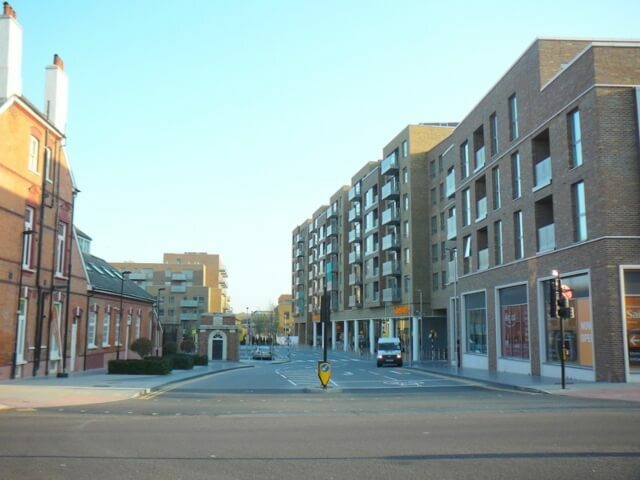 The whole site, 13 acres in total, in Hornsey village conservation area, was destined for commercial redevelopment from the start of the new millennium. The plans drawn up for a housing development and a retail outlet met with fierce local community opposition. Access to the new apartments and supermarket would mean that the public baths and washhouse would have to be demolished. A public campaign to save the building followed, led by local resident, Joyce Rosser, supported by the Hornsey Historical Society and its President Ken Gay. Initially it was hoped that the building could be retained as a retail facility, restaurant or wine bar. As Ken Gay reasoned, “Hornsey baths is not a large dominant building but its unique façade helps characterise Hornsey High Street Conservation Area and should be preserved”. However, the building was not locally listed and application to English Heritage for national listing was not granted in August 2007. The developers took some note of the local community’s sentiments. Part of Myddelton House block of apartments has been called Bath House Court. 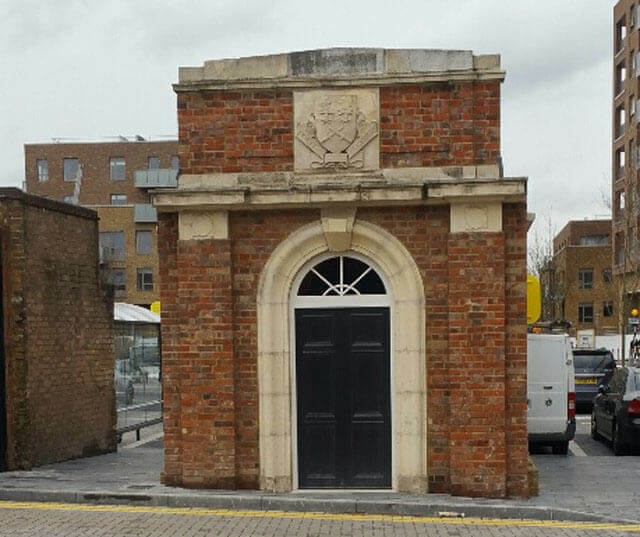 The doorway of the baths with its Hornsey coat of arms has been retained. It no longer stands on Hornsey High Street but is set back next to the rear of the Turkish Community centre and mosque as the frontage to an electricity sub-station. A reminder of Hornsey’s long social history and of a much loved building in the heart of the community.